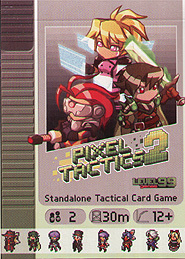 Step back into the golden age of Strategy Card Games with Pixel Tactics! Recruit your heroes, build your unit, and take your forces to battle against your opponent in a light-yet-deep tactical duel! Each hero in your deck has 5 ways to go into battle, and choosing the right time to use the right hero will be critical to victory. This game can be played alone, or combined with Pixel Tactics for even more fun!